Ultimate Way to Deal With Ice Dams in Norton, Massachusetts | Boss Services Inc.
Over the years, we have seen a lot of homes that have had to get roof repair or replacement due to the formation of ice dams in the winter. They can be caused when water from melted snow freezes at the edge of the roof-line. As the freeze-thaw cycle continues throughout the season, the collection of ice that develops can grow quite large. Water from future melts – whether due to seasonal temperature changes or from heat loss on a poorly insulated roof – has to go somewhere. If it can’t get past the ice dam, it will drain into your home. Our Norton roofing company provides a wide range of professional roofing services right here in Massachusetts. Whether you require new roof installation in Norton or repair in another location, you can count on BOSS Services, Inc. to get the job done right. There are three ways to handle ice dams. You must choose one method to protect your home. This is not one of those home repair jobs or services that can be ignored. Make sure to find a service provider that you trust, that is licensed and insured, to provide you with roof repair or replacement. If you have never seen an ice dam before, whether you are new to the New England area or if this is your first time owning a home, it is important to know what to look for to prevent damage. 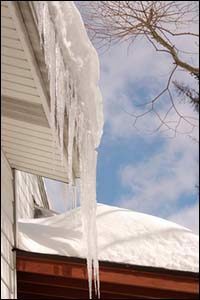 While most ice dams are formed along the edge of the roof, there are other locations where they can form as well. Depending on the slope, type and design of your roof, other areas can accumulate ice as well. If you aren’t sure, it pays to hire professional roofing services like BOSS Services, Inc. to come out and inspect your hope for possible ice dam issues. Working with a reputable Norton roofing company is important to ensure that the contractors have experience with the needs and demands of the local area. Step One: Check the Icicles – Take a look at the icicles around the exterior of your home. If you only see icicles around the gutters and there isn’t any water sitting behind them, your chances of an ice dam are low. However, seeing icicles of any kind can be a warning sign of an ice dam that is building. Icicles themselves can be dangerous, causing damage to personal property, people and pets, so it is important to remove them carefully, hiring a contractor if necessary. Step Two: Check for Stains – If there is an ice dam on your roof, you will have moisture or water stains inside your attic, along the ceiling edge of exterior walls or in other exterior wall areas of your home. Water stains and interior moisture can be a sign of an ice dam. Once the water begins to penetrate your home, you need to act quickly to prevent further damage. Contact a company that specializes in roof installation in Norton for professional roofing services. The first way is to deal with the ice dams as they form. Once you identify that you indeed have an ice dam on your roof, you can break the ice dam free by cutting it into chunks. Don’t make the mistake of other homeowners by using a sharp tool. Some have even wielded an axe to chop the ice away from the shingles while standing on a tall ladder. Not only is this dangerous, but it is also potentially damaging to your roof and your home. If the gutters and downspouts are the problem, you can also get up on a ladder and remove the ice from these areas as well. Ice dams can be melted through the use of calcium chloride ice melters. It is important that you know what you are doing to prevent damage to your home and landscaping. The second way is to take action to prevent ice dams from forming. There are things that you can do to ensure that you don’t have the ideal conditions for ice dam formation. Professional roofing services can help you with some of these methods, including replacing the lower portion of your shingle roof, for best results. Our Norton roofing company provides a wide range of professional roofing services. Installing a water-repellent layer under new roofing can help prevent any melted water from getting indoors. Make sure to ask about other roofing solutions when you get roof installation in Norton. The third way is also the very best cure for ice dams in the northeastern states. In fact, it is the solution that most professional roofing services recommend the most. The use of de-icing cables, installed along the roof’s edge, prevent ice from forming and building up to cause the ice dam effect. This very cost-effective solution can help to prevent ice, even after heavy snowfalls. It is important to have this device installed by a professional Norton roofing company to ensure that the water that drains from the melting snow and ice is properly routed away from the structure. This will prevent icicles from forming, freezing from occurring inside gutters and downspouts, and reduce other damages that can lead to roof repair and replacement. It is important to hire a reputable Norton roofing company to provide professional roofing services in order to get a proper ice dam cure. Once the work is done, you will also notice a big difference in thermal control throughout your home during the winter. Give us a call at 508-297-0635 to find out if your home is a candidate for de-icing cables or if you are in need of roof repair and replacement from previous ice dam experiences. Since 1989, BOSS Services, Inc. has provided top quality contracting services and craftsmanship to homeowners and property owners throughout the local region.